Well the ball had to start rolling our way at some point right? 3 straight wins is a good start to going 9-7! 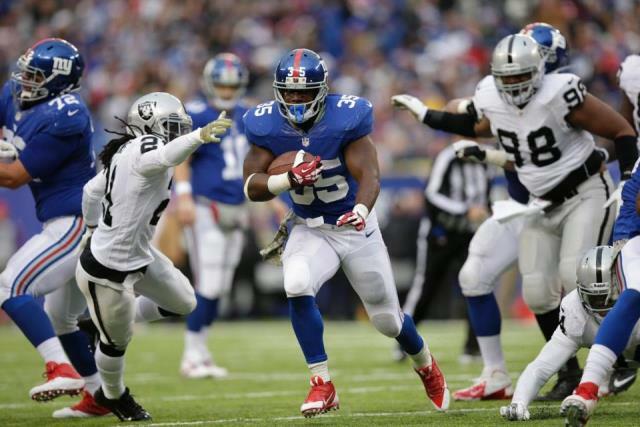 Andre Brown returned just in the nick of time as Peyton Hillis looked less magical this week. 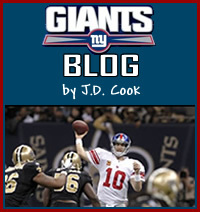 He delivered the Giants their first big day on the ground with thirty attempts and 115 yards. He looked like every bit the hungry runner he was before his injury, which was especially exciting to see. Eli continued in his slump looking a bit lost and throwing a bad interception. Cruz has also seemed like much less of a factor this year but that is of course tied to Eli or maybe it’s actually vice versa. Although I’m very happy to get the third win of the year…it is in…NOVEMBER! The season stands on the edge of a knife and if the Gmen stray but a little it will fail. Speaking of failing I found myself in quite a pickle this week as the Giants were ousted from television by the EVIL Philadelphia Eagles and Pittsburgh Steelers who happened to be playing at the same time as my team. Thus I was forced to venture forth from my home to my local Damons where I was charged an arm and a leg for food and drink. If I had been back in New York City where I attended college I could have used this awesome website I was just told about called Sportchaser.com. I did a quick search for fun and found a ton of great options! The sites a genius idea and reminds me of the episode in How I Met Your Mother called ‘Little Minnesota’ where Robin and Marshall go to a bar full of Vikings fans to watch the games and be with their fellow Viking lovers. Sportchaser.com is a great why to find your own ‘Little Minnesota’ where you can hang with fans of your own favorite team in the Big Apple. Maybe one day the site will even expand to help people like me find our own special bars in tiny Pennsylvanian towns filled with Eagles and Steelers controlled establishments. I mean there has to be one Giants themed bar in Northeastern PA right? Alright back to this Sundays win! The defense continues to look ‘good enough’ as they make the occasional big play and hold the opposing offense when they need to. They even got in the backfield a bit on Sunday but I’m not sure if that was a good front or a bad Raiders offensive line. Rolle continues to be the heart and soul of the defense. The Giants do not make free agent pickups often but when we do they are good and he was one of the best we have ever acquired. He is so fun to watch and he really makes a huge difference when he’s on the field. On the flip side of the team Reuben Randle might be the next clutch receiver for the team as he has been having consistent productive games. This might be because the opposing team doesn’t focus on him but I love a wide receiver that does nothing but make catches when they matter. Ok keeping this short this week. The Raiders weren’t a good team but a win is a win. This week if we face an Aaron Rogers led Packers team we will be running into a buzz saw but if we face the same squad the Eagles faced there is a good shot we can steal another easy win and have our 4th win of the season. That said there are still about a dozen mistakes the team needs to cut down on before they have a truly successful game. I have yet to see the team really click. Every game consists of fumbles, interceptions and returns for touchdowns. The Giants have returned to a run first football playbook which is great but now it’s time to lock down fundamentals and cut out mistakes. They won’t win those nine games with the same kind of football they’ve been playing the past ten weeks!